If I close my eyes and squeeze them tight, I can see Juanita as I met her when I first arrived in Santiago Atitlán, Guatemala in 2004. I was a Peace Corps volunteer, working as an environmental education teacher in rural schools and Juanita was a 5th grader in my class. She was one of two female students amongst a sea of male classmates, and while she was the smallest student in her group, she made the most memorable impression on me. Juanita shimmered with confidence, kindness and diplomacy. After she graduated from elementary school, my life continued to intertwine with Juanita’s. In fact, she “grew up” with La Puerta Abierta. We opened our library and learning center in 2006 just as she graduated from elementary school. She was eager to participate in her community and was hungry to read and learn more about the world beyond the boundaries of Santiago Atitlan. She was one of our first local volunteers at our center and would dedicate a few hours every week to organizing books in our library collection, preparing materials for our story hours and designing our bulletin boards. As the years passed, Juanita became increasingly busy with high-school projects, extra curricular activities and family commitments (Juanita is the oldest of 4 sisters.) Even when her days felt full, Juanita would find small windows of time to collaborate at La Puerta Abierta. 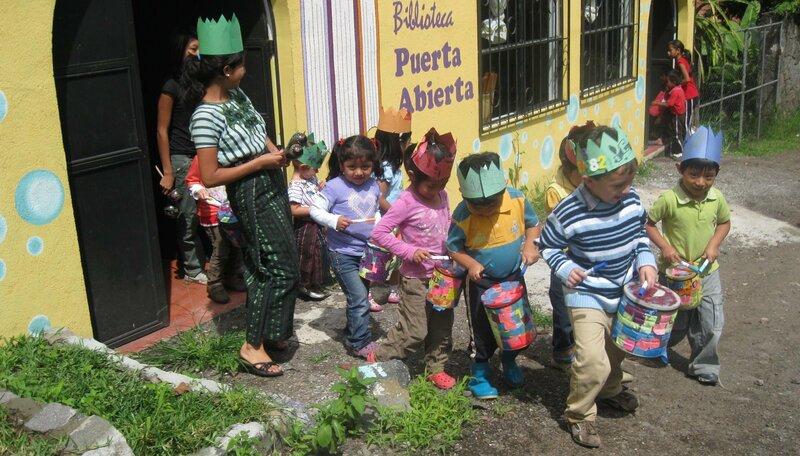 Four years ago La Puerta Abierta expanded to incorporate early childhood education classes into our program. The development of our preschool coincided with Juanita’s graduation from teaching school in Santiago Atitlan. As we interviewed Juanita for a position as a teacher at our center, she shined with the same confidence, intelligence and creativity that I detected in her years prior. After “growing up” in our center, she was an ideal match for our school. Juanita has dedicated the past four years to working with children at La Puerta Abierta. She’s had experience teaching preschool, kindergarten, first grade, early stimulation, and managing our traveling library. Today, Juanita is the assistant director at La Puerta Abierta and helps to ensure that our programs are strong, stable and smooth. She greets parents in the the morning with warm smiles, helps our staff develop curriculum, organizes field trips, evaluates students, and welcomes volunteers to our center. In fact, I’m quite certain that we’ve come full circle and that I’ve nearly worked my way out of a job…a satisfying revelation for those of us in the field of development. Juanita continues to dream big. In addition to working at La Puerta Abierta, she is studying psychology at the university and hopes to develop community programs that benefit youth, teens and elders in the future. As I reflect on Juanita’s experience, I realize that La Puerta Abierta is much more than a learning center for children. We are also a training center for teachers, providing a space to cultivate young educators. And I couldn’t be more proud that Juanita is now training our new teachers at La Puerta Abierta.